Did your hometown have a spooky story that all the kids tell at campfires and sleepovers? 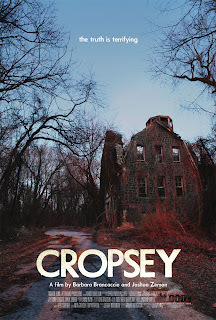 Cropsey is a documentary all about that creepy story for Staten Island. It explores the rumors and the all-too-true cases of missing children. I'm not sure they make their case all that well, but it was worth watching and debating. Some of the spaces they show (in the local abandoned mental hospital no less) are terribly interesting to see. Our local tale was about Mary Stockums who was buried in two graves - one for her head and one for her body. She was rumored to search for her head at night. Used to scare me silly when I was little! This has been on my instant watch queue for a long time, gotta watch it.